Simplipur Lean 2.0 Reviews: Does It Work? What is Simplipur Lean 2.0? Weight loss supplements are some of the most popular supplements on the market but if you are looking for a supplement that takes a unique approach to weight loss, Simplipur Lean 2.0 may be what you have in mind. Simplipur Lean 2.0 is a weight loss supplement that comes in as 2 packages: one supplement that you take in the morning and one that you take at night. The two work as a symbiotic weight loss system. According to the makers of Simplipur Lean 2.0, this is an effective way of handling weight loss because in the morning, it provides your body with the ability to burn fat for fuel and at night, it helps to build lean muscle tissue. Both of these processes occur naturally in our body and Simplipur Lean 2.0 is a way to optimize the process. Both the A.M. and P.M. weight loss supplements come in capsule form. Who is the Manufacturer of Simplipur Lean 2.0? Simplipur Lean 2.0 was created by a company called SimpliPur, LLC. SimpliPur, LLC is based out of Gulf Breeze, Florida and they believe that their 2 supplement system can work for you. According to the website for Simplipur Lean 2.0, the product has been tested on more than 190 study subjects and the results prove that the system works. We are also told that this product will be effective at freeing fat of triglycerides and that it uses freed fat as energy. How Does Simplipur Lean 2.0 Work? One of the main functions of Simplipur Lean 2.0 is to free fat of triglycerides. It is when triglycerides are bound to fat that they actually result in weight gains. When fat is free of triglycerides, it is then released to be burned off as energy in the body. Triglycerides also cause problems for the heart, liver, and other organs. Simplipur Lean 2.0 claims to free fat so it can be burned off. Simplipur Lean 2.0 Ingredients – Are They Safe & Effective? The majority of the ingredients between the AM and PM supplements of the Simplipur Lean 2.0 system are found in the PM capsules. The PM capsules contain a proprietary blend of ingredients that appear to be all natural. Let’s take a look at both of them. Grapefruit – Grapefruit extract is found in the AM capsules and may help with weight loss due to its ability to fill you up and lessen cravings for calories throughout the day. Guarana – Also found in the AM capsules, Guarana acts as a stimulant, providing energy and boosting the metabolic process. Orange Extract – This is the last active ingredient in the AM blend and may help burn off fat via amino acids. Barrenwort – This ingredient is part of the proprietary blend in the PM capsules and is believed to help burn fat. Boron Citrate – Boron which is found in the PM blend citrate may help the body absorb more nutrients such as calcium. Fenugreek Extract – Fenugreek may inhibit fat absorption in the body and is found in the PM blend. Maca Extract – Maca may be able to help the body’s metabolic processes and contains flavonoids and is also found in the PM blend. What are the Advantages of Simplipur Lean 2.0? Simplipur Lean 2.0 may help you build lean muscle tissue while you sleep. It may be possible that Simplipur Lean 2.0 actually helps your body burn more fat. This product may be able to help rid the fat of binding triglycerides. There are lots of natural ingredients in Simplipur Lean 2.0. What are the Disadvantages of Simplipur Lean 2.0? Some studies have shown that tribulus terrestris, found in the PM capsules, may not actually help for weight loss. The label of this product clearly states that weight loss can only be achieved through diet and exercise. Individual results may vary when taking this product. Guarana may act as an irritating stimulant for some users. How Should You Take Simplipur Lean 2.0? The directions for the AM capsules are to take two of them in the morning with a meal. The directions for the PM capsules are to take 2, also preferably with a meal. How Much is Simplipur Lean 2.0? 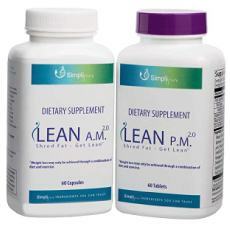 With a purchase of $39.95, you will get both AM and PM Simplipur Lean 2.0 supplements. Each container has 60 capsules which is about a one month supply. What is Simplipur Lean 2.0’s Return Policy? You can return Simplipur Lean 2.0 whether they have been used or not within thirty days of the initial purchase. Buyers will still be responsible for shipping fees, however. Does Simplipur Lean 2.0 Offer A Free Trial? There is no free trial of Simplipur Lean 2.0 being offered. It may be because the Simplipur Lean 2.0 system includes two separate supplements. After taking a long look at Simplipur Lean 2.0, we have concluded that there is almost an even amount of benefits and disadvantages tied to the product. For starters, Simplipur Lean 2.0 may be able to free fat of binding triglycerides, it may help to build lean muscle tissue, and the ingredients seem to be natural. On the other hand, we read on the label that weight loss is only possible through diet and exercise, there may be some filler ingredients in the product, and the system as a whole requires you to take 2 separate sets of supplements a day. If you are looking for a way to lose weight take a good look at Simplipur Lean 2.0 and also some comparable top rated diet pills before making the final purchases.